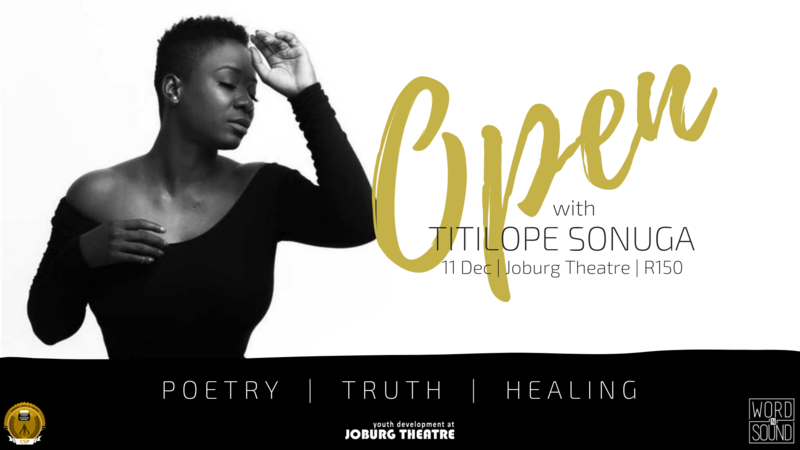 Spoken word and literature enthusiasts will get an early festive season present after award winning Nigeria Poet, Titilope Sonuga added Johannesburg to her highly anticipated Open Tour which also includes Edmonton, Calgary, London, Lagos and Abuja. Titilope Sonuga is an award-winning poet, writer and performer based in Lagos, Nigeria. She is the winner of the 2011 Canadian Authors’ Association Emerging Writer Award for her first collection of poems, Down To Earth. Her second collection Abscess was published in 2014 by Geko Publishing (South Africa). Her work has appeared in Brittle Paper, The Great Black North: Contemporary African Canadian Poetry, was translated into Italian for El-Ghibli Magazine, and into German for the Berlin International Poetry Festival. She is the recipient of the 2018 Edmonton Arts Council Large Project Grant to produce her next spoken word album “Swim”. Her collection of poetry This Is How We Disappear is forthcoming with Write Bloody North in the spring of 2019. On December 11th, doors will open at 7pm with the show starting at 8pm sharp and ticket will be available at the door or pre-sold online. For more information about Tittilope Sonuga and more information about other Open Tour dates and cities please visit Titilope’s official website or follow the artist on twitter @deartitilope, Instagram @titilope and #openwithtitilope. ← The Live Literature Market is back!